Including one-time expenditures, the total amount is a 5.1 percent increase over 2016-17, hammered out by the legislature and former Gov. Pat McCrory. Without those non-recurring funds, the budget is 3 percent higher than the previous one. Cooper is counting on Medicaid expansion to help offset state health care costs in a “cost-neutral manner.” The governor is counting on hospitals to cover the state’s portion, which he said would ultimately save those institutions money it would otherwise spend on providing care for the uninsured. Another 624,000 North Carolinians would be covered under Medicaid if it were expanded, Cooper said. 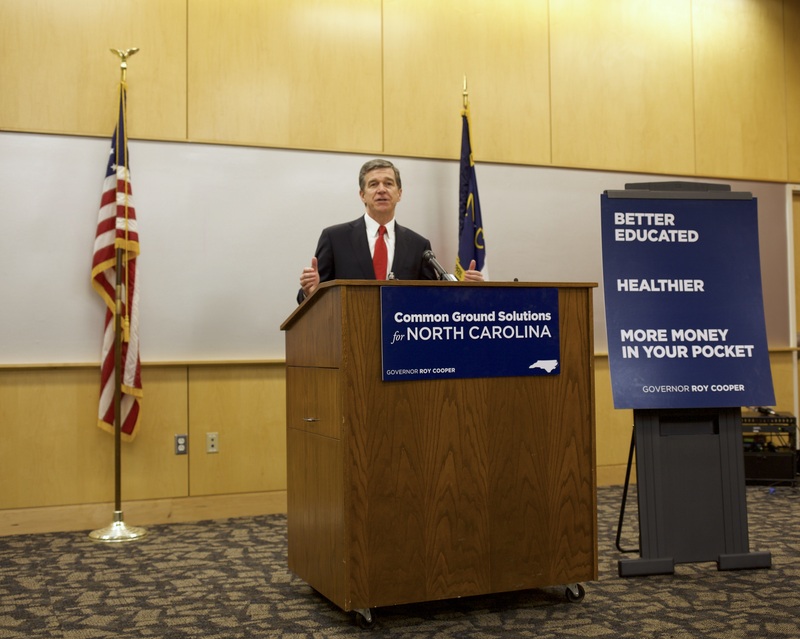 North Carolina’s rural and underserved areas would also receive an infusion of funds. About $30 million is included for the redevelopment of “NC Ready” sites. Those are tracts of 50 to 200 acres that could be repurposed for economic development. To attract good-paying manufacturing jobs, Cooper proposes spending $20 million to build infrastructure for new factories. Although North Carolina’s unemployment rate was 4.9 percent in December, 59 of 100 counties reported rates higher than the statewide average. Eastern North Carolina is particularly hard-hit, with Hyde County at 11.6 percent of eligible adults out of work and Tyrrell County at 10.3 percent. Low wages, a lack of education and opportunity — in a word, despair — has led to a sharp increase in opioid deaths nationwide, and North Carolina is no exception. In 2015, 735 deaths were attributed to prescription opioid overdoses, more than the number of caused by heroin and cocaine, combined. In 1999, the state reported fewer than 100 such deaths. To combat the state’s problem with opioid abuse, Cooper has requested $12 million next year. There is also $100 million allocated for hurricane and disaster relief reserve. Other notable, although easily overlooked line items include $1 million to help keep the state’s military bases open when the next round of closures begins in 2018. Those bases, including Camp Lejeune, Seymour Air Force Base, Pope Field, Cherry Point and Fort Bragg, are key to the economy in their communities. As part of the “Raise the Age” campaign — it would prohibit 16- and 17- year olds from being tried as adults, regardless of the severity of the crime — Cooper said another juvenile center would need to be built. That could raise concerns among juvenile justice advocates who want to keep these kids out of institutions. Nonetheless, he is requesting $1 million the first fiscal year and $5 million in the second to accommodate those teens into the juvenile justice system. The 895,000 people in North Carolina without access to high-speed internet could be helped by a $15 million broadband grant program. It would help deliver what’s known as “last mile” and “middle mile” high-speed internet to rural areas, particularly in the mountains. Another $5 million would be used to assess the state’s broadband needs.